Bionics is the study of biological functions and the development artificial organs and body parts that are used as a replacement of the original part or organs. The bionic organs are designed in such a way so that they can imitate the functions of the organs in order to operate properly. The market is expected to grow during the forecast period due to the increasing demand for artificial organs in the healthcare sector. In addition, the aging population is resulting into multiple organ failure. This in return is creating a need for organ transplant. However, the chance for getting a suitable donor for a transplant requires lot of time and thus reduces the chance of survival. The use of bionics part does not require time and these parts are designed to adjust with the body requirements. Furthermore, the bionics are also being applied in the defense sector in the form of exoskeleton suits which enables a soldier to carry heavy loads without reducing his or her speed in the battlefield. The global bionics market can be segmented by types into bionic brain, bionic heart, bionic limbs, vision bionics, exoskeleton and others. In terms of application the market has been divided in healthcare and defense. Furthermore, the bionics market has also been segregated by types of technology into mechanical bionics and electrical bionics. Globally, bionic limbs occupy the largest market share by types of bionics, followed by bionic heart. The bionic limbs are extensively being used globally as an alternative solution after amputations and increase in heart failure is resulting in the development bionic heart replacement organs. The global bionics market has been valued at USD 7.96 billion in 2014, growing at a CAGR of 13.2% from 2015 to 2021. The bionics is majorly used in the healthcare sector in the form of artificial organs to replace the malfunctioning organs in the human body. In addition, the bionics is also being applied in the defense sector to create exoskeleton suits for soldiers to give them added advantage in the battle field. By geography, the global bionics market has been segmented into North America, Europe, Asia Pacific (APAC) and Rest of the world (RoW). The bionics market is facing demand due to the increasing cases of accidents which is leading to paralysis or amputation of limbs. In addition, the aging population is resulting into organ failures, which is fuelling the growth for this market. In 2015, North America is leading the global bionics market and is expected to dominate the market during the forecast period. The increasing application of bionics as a replacement for organ transplant is acting as a driver for the market. North America is followed by Asia Pacific accounting for than 20% of the global market. Asia Pacific is also the fastest growing region due to the presence of major economies such as China, Japan and India. However rest of the world is expected to maintain steady growth due of the developing regions as the use of bionic organs is very expensive. The global bionics market by types is categorized into bionic brain, bionic heart, bionic limbs, bionic vision, exoskeleton and other bionic organs. The bionic limb has the highest market share in 2015 and is expected to dominate the market during the forecast period. The growth of bionic limbs is due to increasing number of accidents which is leading to amputation or paralysis of limbs. In terms of application, the bionics market can be segmented into: healthcare and defense. The bionics is majorly used in the healthcare sector and account for nearly 75% of the global bionics market. However, the defense sector is the fastest growing segment during the forecast period. Bionics is the study of biological functions and the development of artificial organs and body parts that are used as a replacement of the original part or organs. The bionic organs are designed in such a way so that they can imitate the functions of the organs in order to operate properly. The market is expected to grow during the forecast period due to the increasing demand for artificial organs in the healthcare sector. In addition, the aging population is resulting into multiple organ failure. This in return is creating a need for organ transplant. However, the chance for getting a suitable donor for a transplant requires lot of time and thus reduces the chance of survival. The use of bionics part does not require time and these parts are designed to adjust with the body requirements. Furthermore, the bionics are also being applied in the defense sector in the form of exoskeleton suits which enables a soldier to carry heavy loads without reducing his or her speed in the battlefield. However, the market is facing restraint in the form of high of these devices. The bionic organs are very costly and cannot be afforded by everyone. Moreover, the development of the bionics organs involves extensive research and development which can only be funded by governments. These factors are expected to hinder the market initially. The bionics market is expected to grow due to their rising awareness in the emerging economy. Furthermore, developing countries such as India and China are expected to push the market for growth in future. In addition, the improving income levels are ensuring the purchase of these devices for a better future. Moreover, in future, the bionics is expected to be the substitute for robotics market. The idea of developing a fully functioning artificial human being with the help bionic organs is being considered and this can replace the robots in the near future. The global bionics market report has been analyzed in terms of revenue (USD billion). The forecast period of the analysis is from 2015 to 2021. Furthermore, the report includes the key factors that are pushing and pulling the market in terms of the drivers and restraints. In addition, the future opportunities that can affect the market have also been discussed. 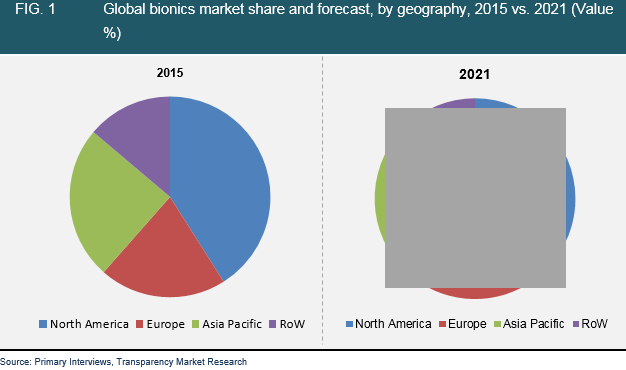 The region segmentation for the bionics market has been done by North America, Europe, Asia Pacific and Rest of the World (RoW), and these have been estimated in terms of revenue (USD billion). In addition, the report segments the market based on the types, which include bionic brain, bionic heart, bionic limbs, bionic vision, exoskeleton and others. The global bionics market can also be segmented by application. The bionics devices find their application in healthcare and defense sectors. In addition, the market has also been segregated in terms of types of technology into mechanical bionics and electronic bionics. All these segments have also been estimated on the basis of geography in terms of revenue (USD billion). In order to understand the bionics market better, a key trend analysis section has also been provided which discusses the growth in various segments. In addition, the key players profiled in the report have further been analyzed in terms of the global market share held by them. In the end, the report also covers the profiles of the leading vendors on the basis of their company overview, key developments, financial statements and business strategies adopted by the players in the global bionics market. The major players profiled in the report include: Abiomed, Inc., Asahi Kasei Medical Co. Ltd, Baxter International, Medtronic Plc, Ekso Bionics and Sonova Holding AG among others.